Hello! Happy Sunday! I hope you are all having a great weekend! I've managed to get some "me" (aka stamping) time in as well as family time, so it's been a good weekend here. Today I have a card that I made for my niece, Evie, and her fiance, JR. They are getting married next weekend.. I cannot believe the day is almost here!! 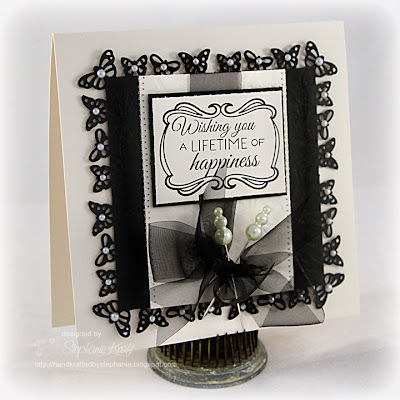 Her wedding colors are black and cream AND she loves butterflies, so that's what I went with for the card. I pulled out the newly released (perfect timing!) Verve set, Love Story, and stamped the frame and sentiment. I created the butterfly border with Martha Stewart Monarch Butterfly punches. I added some subtle dry embossing on both the black and smaller cream layer, though it's hard to see in the photo. I also added cream pearls to the center of each butterfly. Some sheer ribbon, pearl trinket pins and a little stitching finish off the card. Accessories: Monarch Butterfly edger and corner punches (Martha Stewart), Butterfly Impressabilities (Spellbinders), Sheer ribbon (May Arts), Trinket pins (Maya Road), 3 mm and 4 mm cream pearls (Pizzazz Aplenty), Foam tape, Thread, Sewing machine. What a breathtaking card Steph! LOVE all the butterflies and pearls! Your little one is just BEAUTIFUL!!! Oh well, Sabrina is just gorgeous and she's doing wonders for that dress! 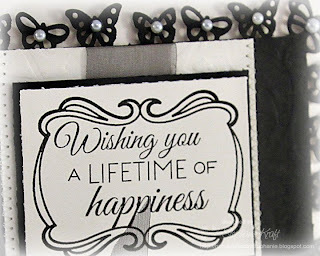 Gorgeous card, so elegant! Another winner, Stephanie! Lovely card, but stunning Sabrinia! Thank you for sharing. Oh my! Look at Sabrina! She looks so beautiful! Your card is gorgeous too :) So elegant! 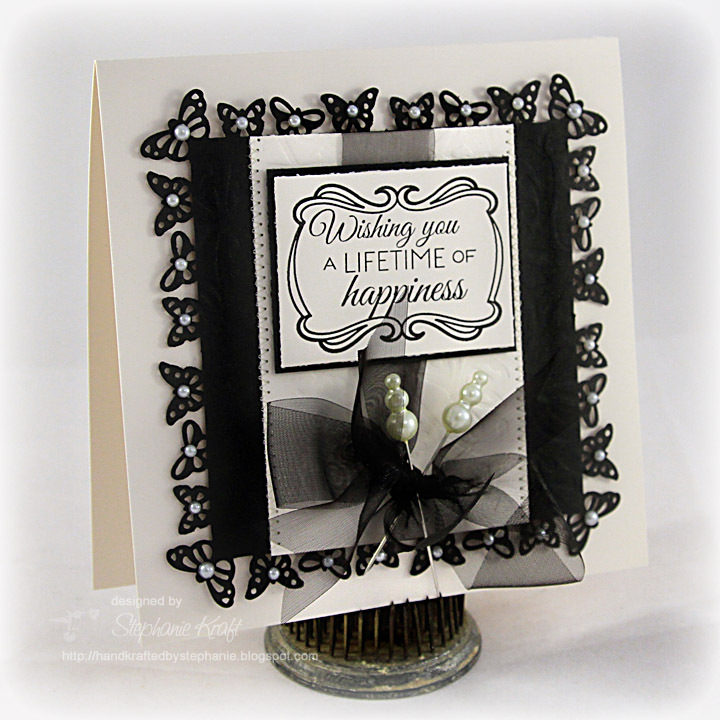 What an amazing way to use the butterfly die cuts!! I just love this idea! Thanks for the inspiration! 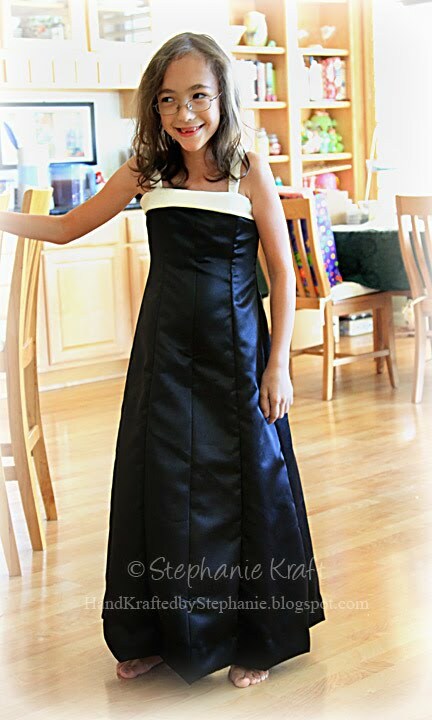 OH my Goodness Sabrina looks so beautiful..The dress is amazing... Your Niece is going to love this card. So elegant with the the pearls pins and sheer ribbon..Beautiful!! 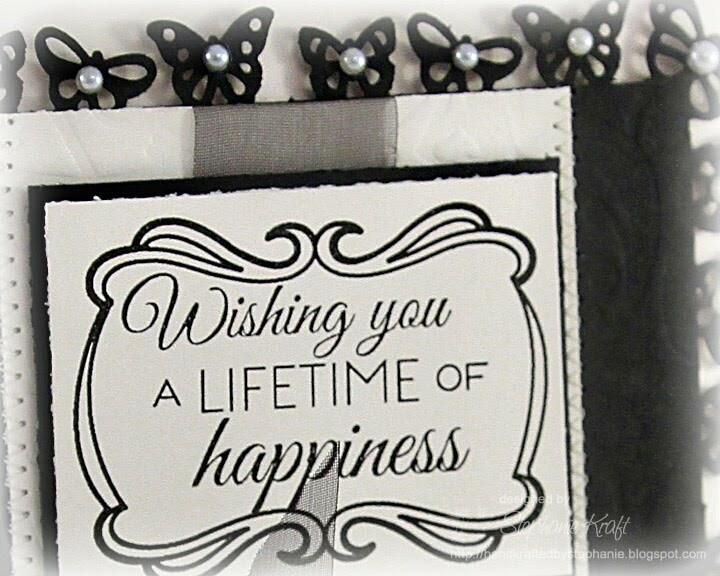 This is a beautiful and elegant card and perfect for the wedding. Your daughter looks so beautiful in her gown. Fantastic sewing too!